34 dishes that will make you crave Slovak food (with recipes) • Where Is Your Toothbrush? In Slovakia, a historically agrarian society, food is fuel. Traditional Slovak cuisine provided high-energy, low-cost, and recipe quick-prep sustenance to peasants, herders, and laborers. Slovak food, therefore, leans heavily toward potatoes and wheat (dough, bread), cabbage and onions, apples and plums, dairy (milk and cheese), and poultry and pork. 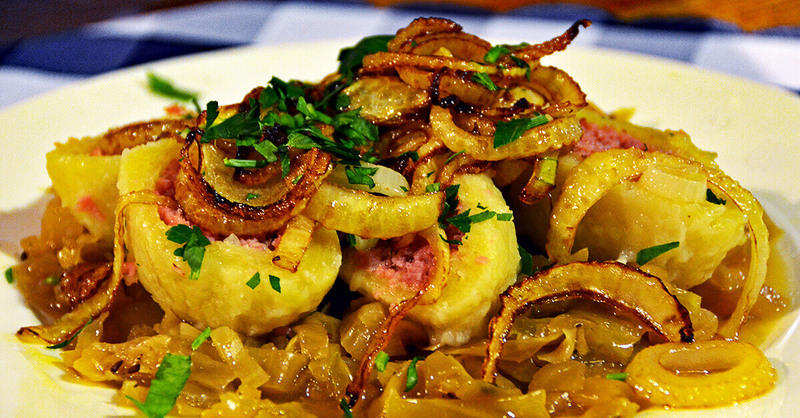 Typical Slovak dishes are simple, filling, comforting, and homey—and they pair well with beer. 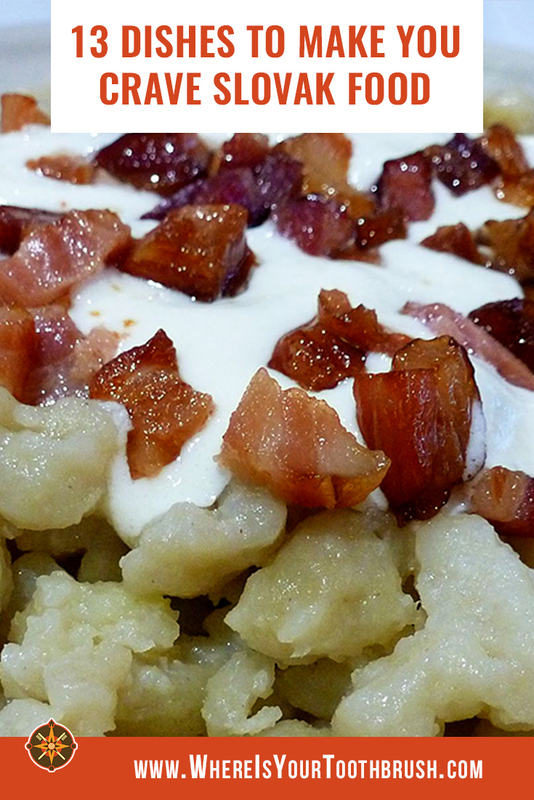 For example, the Slovak national dish, bryndzové halušky, is potato-dough gnocchi smothered in salty sheep bryndza cheese, and topped with smoked bacon bits. With Slovakia’s territory located in the heart of Europe and the lands historically ruled by outside powers, traditional Slovak cuisine is heavily influenced by Hungarian, Austrian, and Czech cuisines, with some Turkish influences. Of course, the greatest influence is American by way of the potato. Moreover, there are quite a few regional variations to the traditional dishes, and some regions developed their own dishes not found elsewhere. From the mountains in the north to the plains in the south, Slovak cooks traditionally used efficient produce from their gardens and fields and products from animals they raised or tended to. Goose is popular in Western Slovakia, Hungarian dishes along the border with that country, and sheep milk specialties in the mountainous Northeast. As for eating habits, Slovaks eat three main meals every day, with desiata (a ten o’clock elevenses) and olovrant (afternoon snack) sometimes squeezed in between, particularly for children. Bread is the foundation of breakfast, served with butter and jam or honey, and more and more frequently with meat products like ham and salami. Fried or boiled eggs sometimes accompany the meal as well. In recent decades, a growing number of health-conscious Slovaks add fruits and vegetables, and substitute the gluten and fat-heavy stuff with cereal like muesli and yogurt. Lunch is traditionally the main meal, eaten at noon, with soup and the main course (some main courses are sweet dishes, see below). With accelerating lifestyles, Slovak lunches have shrunk, and dinner, traditionally eaten at 6:00 p.m., has gained in importance. Despite the limited variety of traditional ingredients, Slovak dishes provide quite a range of flavors. This should become all the more obvious from our compendium of Slovak food. In addition to our own descriptions of Slovak cuisine, we asked our fellow travel bloggers to share the best dish they had sampled on their travels in Slovakia (Lindsay, as the non-Slovak half of Where Is Your Toothbrush?, added her own favorites). What we received pleasantly surprised us both in terms of variety and how much the travelers enjoyed Slovak cuisine. With that, we are proud to present 34 traditional dishes of Slovakia that will make you crave Slovak food. Get this guide as an ebook for ONLY $0.99! Soup in Slovakia is beautiful. Traditionally, soups in Slovakia were standalone meals. Eaten with bread, soups like goulash can satiate on their own. Over the years, Slovak soups have thinned out, with vegetable soups and broth-based soups gaining popularity. And though Slovaks eat less and less soup, the dish remains the most quintessential of meals: almost every lunch or dinner in Slovakia begins with soup. Slovaks think it’s strange if you don’t have soup prior to every meal. One way to identify a foreigner is that they don’t have soup as a first course. Take clear chicken soup with homemade noodles, a Sunday lunch classic. What would be a gourmet soup at a high-end bistro is the most down-to-earth basic dish in Slovakia. Soup is also part of old traditions: for example at weddings the newlyweds eat soup from the same plate to symbolize their unity. Slovaks love soups, we live on soups, we eat some pretty much every day. There is always a pot of soup in the house. Beware: If you come from a culture where soup is a meal in itself, as in the United States, you have to learn how to not fill up on soup in Slovakia, lest you offend your hosts or leave your restaurant meal unfinished. Particularly hearty soups, like kapustnica (sauerkraut soup) or fazuľová polievka (bean soup), can constitute a meal on their own, so fill your plate with moderation. Kapustnica is the most traditional and common Slovak soup. 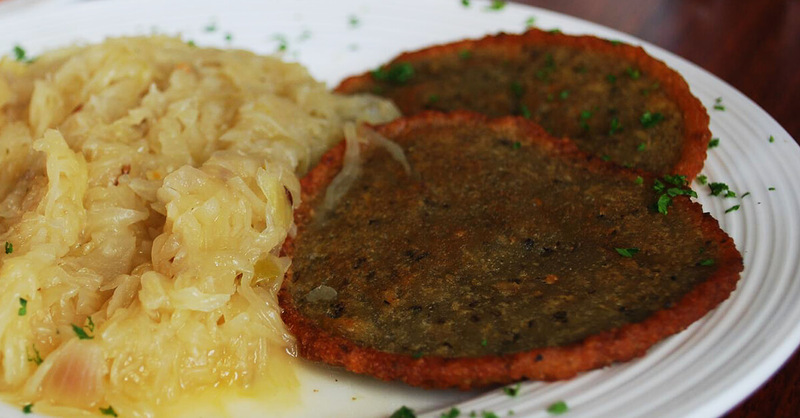 It’s the ultimate comfort food, made with sauerkraut, potatoes, dried mushrooms, onions, and sausage and other smoked meat. No other national(ish) dish elicits as much passion as kapustnica. Every Slovak region or town has its own variation; every Slovak cook makes it slightly differently, swearing theirs is the best version. To Slovaks, the Christmas holiday connotes a lot of things—Baby Jesus, the tree, presents, snow (if you’re lucky), watching old movies with family—but what really makes it is the Christmas Eve dinner. And, as the first course, kapustnica brings the family together for the celebration. You can have kapustnica any time of the year, but Christmas is when you must. I’m about to scoop into a traditional soup called kapustnica. First, let me point out that I’m dining with a mayor of a town near Slovak Paradise National Park. She brought me to a local restaurant to get a taste of Slovakian history. Let me give you the scoop on the soup: This is a cabbage soup brewed to succulent perfection, typically mixed with onions, dried mushrooms, sauerkraut, slices of sausage, and sour cream on top. I had the added bonus of having mine served in a bowl made of fresh bread. Imagine the smell of standing in a bakery and cracking open a pot of amazing soup. Particles of allspice, nutmeg, garlic, paprika, smoked sausage and baked bread hit your palate at once. This is a simple dish perfected over centuries. Many other countries have variations of cabbage soup, but they don’t compare to kapustnica, holding a spot in Slovakian cuisine across the country. I’m not that big into soups, but this is one that I ordered repeatedly during my travels in Slovakia. The final spoonful of broth only meant the second meal was about to begin, and it looked vivid with flavour. The inside of my bread bowl had been absorbing the savour, while still remaining crunchy on the outside. It was like crackers and dip mixed into one delicious bite. Kapustnica. 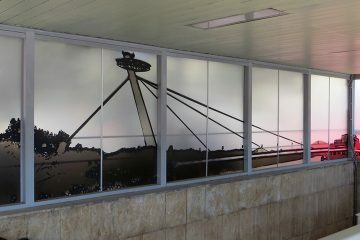 Photo by Siya Zarrabi. 1.5 qt sauerkraut. Home-made rather than store-bought (canned or bottled) sauekraut is best, as it’ll be more flavorful. Boil sauerkraut in 3.5 quarts / liters of water in a big pot and cook on low for 20 minutes. Meanwhile, sauté onions and mushrooms, then add them, sausage, and spices except paprika to the big pot. Cook everything on low for 20 minutes. In a separate pan, fry flour in oil until light brown, add paprika, fry some more for a total of 20 minutes until the rue is creamy. Add rue to the soup and bring to boil again. Let simmer for 80 minutes. Bring potatoes to a boil and add them to the soup. Let simmer for 10 minutes and turn off. by Lindsay Sauvé, Where Is Your Toothbrush? 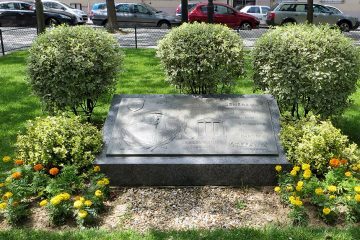 The first time I heard about fazuľová polievka was when my Slovak language school classmate Csaba searched for the best one to have in Bratislava, searching for one similar to his Slovak grandmother’s, of which he had fond memories. He finally found one in a dive-y pub near the dorm where we students were staying. He raved about it so much, I knew I had to try it, especially because I didn’t recall having had any at Peter’s parents’. When I finally sampled the soup, I understood Csaba’s obsession. The soup is creamy, filled with butter-soft brown beans that melt in your mouth. It’s cooked with a hunk of smoked meat that flakes off into the soup and lends it a salty, smoky flavor. 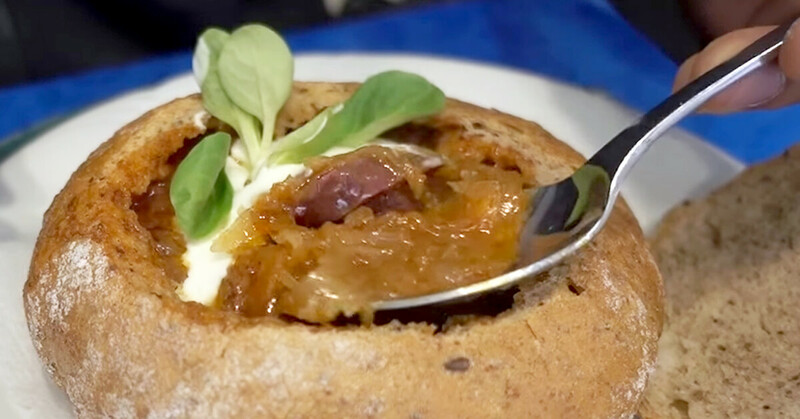 Though Slovaks insist on having an entrée course to follow soup, fazuľová polievka is a standalone meal in a bowl if you have it with crusty bread and butter. It’s comfort in a bowl, and a perfect accompaniment to pint of cold lager in a dark pub or a mountain chalet. A staple of backyard picnics, camping trips, and town fairs, goulash soup is a traditional Slovak dish of Hungarian origin. Based on potatoes and beef chunks, and eaten with wheat or rye bread, goulash is a whopper of a soup. While you can make it in your kitchen, the best variations are made outdoors, in a large kettle or cauldron over open fire. As with kapustnica, every Slovak cook believes his is the best goulash (the soup is particularly popular with men). Goulash cookoffs are held all over the country to find the best local goulash. Chop the beef into cubes, discarding as much tendon tissue as possible, and brown it in a large pot with butter. Add diced onion, then the spices and a mashed-up clove of garlic. Add water, cover and let simmer on low for about 2 hours, until the beef softens. Optionally, make broth from the bullion to thin the soup as needed. Peel and cube the potatoes, and add them to the soup. Add a sliced pepper and diced tomato. Simmer until the potatoes soften. Impossible to translate, prívarok is a vegetable or legume soupy stew thickened with flour. Sour cream, corn starch, or tomato paste can also be added for taste. A hearty Slovakian dish, prívarok is most often made from beans, cabbage, cauliflower, lentils, peas, potatoes, spinach or winter/butternut squash, and accompanied with meat or fried eggs. Some variations, particularly those made with less popular vegetables like squash, often constitute a bane of Slovak children’s dinnertime. Peel the squash, halven it, scoop the seeds out, and grate it roughly. Mix the grated squash with salt and pepper and add it to a light rue, made with with oil and sugar. Cover, and let simmer. Add water, if needed. Mix flour in milk and add to the pot to thicken the contents. Cook for a few minutes and add whipping cream. Bring to a boil and add dill. Serve with cooked diced potatoes and fried egg. Add sausage or smoked meat for additional protein. Following soup as the second, main course at lunch or dinner is typically a hearty dish featuring potatoes and meat or cheese. In entrées, Slovak cuisine shows its fatty colors, with many dishes using lard as the base and meat (chicken, pork, beef, and sometimes venison, rabbit, lamb, or goose) featuring prominently. Potatoes are a staple, either in a boiled diced/mashed form as a side or made into halušky (gnocchi), mixed with bryndza, cabbage, or tvaroh (curd cheese). It is no coincidence that many of the traditional Slovak dishes travel bloggers contributed feature bryndza, a salty sheep cheese included on European Union’s Protected Geographic Indication list (along with Skalický trdelník, and parenica and oštiepok cheeses, see below). Bryndza centers the Slovak national dish, bryndzové halušky, and aside from its use in cooking, it makes for a tasty, tangy spread. Another category of Slovak entrées are doughy múčnik, which derives from the word for flour, múka. Múčnik dishes are basically flour-based desserts served in a portion large enough to be an entreé. Some consider pirohy (see below) a múčnik. To be honest, bryndzové halušky isn’t much to look at. But when you consider its individual components—potato dumplings, tangy creamy sheep cheese, and crisp smoky bacon bits, what’s not to love? Overwhelmed by information on my first trip to Slovakia, I don’t even remember my first bryndzové halušky. Later, on my many visits to Peter’s country, I fell in love with Slovakia’s national dish. It’s basically perfect comfort food, best consumed after some hard work, such as hiking, biking, or plowing a field, and washed down with a pint of cold pilsner. I’ve had it homemade, in restaurants, in cities, in villages, and in the mountains. It doesn’t matter: Slovaks know how to make this dish and make it well. Photo of bryndzové halušky, Slovakian national dish, by Sonia Belviso. Finely grate the potato into a bowl, keeping the juice. Add flour, egg, and salt, and stir with a wooden spoon. Add water and stir until all the lumps are smoothed out. If the dough is too runny, add flour; if too thick, add water. In a large pot, bring water to a boil and add salt. Transfer the potato dough into the boiling water by cutting off small chunks with a spoon or using a spaetzle maker. Gently boil all halušky for 7 or 8 minutes, until they all float to the top. Meanwhile, fry the bacon and dice it into cubes. Strain the halušky and mix with bryndza. Sprinkle the bacon on top and pour the rendered bacon fat all over. Salt to taste and serve immediately. Pirohy would likely share the title of the Slovak national dish with bryndzové halušky were it not more complicated to make. Flattened potato dough is carved into circles, dabbed with a variety of fillings, closed into shape, boiled, and served smothered in butter with a variety of optional toppings. As for the pirohy filling, every Slovak has their favorite. Bryndza is the most traditional; potatoes, cabbage, and tvaroh (curd cheese) are further savory options. Jam is my childhood favorite. Nowadays, health-conscious Slovaks use buckwheat flour to make the dough for pirohy. The absolute best dish I had in Slovakia was bryndzové pirohy (sheep cheese pierogy). It’s one of the national dishes of Slovakia and it’s de-lish. 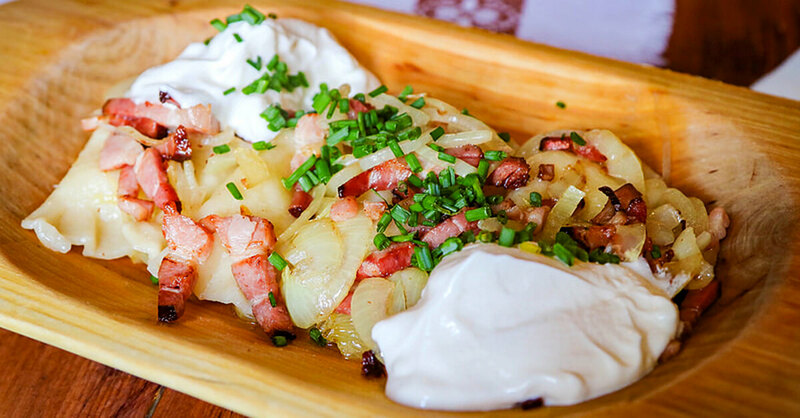 Now, this heavy Slovakian meal consists of potato dumplings (like gnocchi), filled with sheep cheese and topped with sour cream, fried onion, spring onion, and crispy bacon. You can get cheese dumplings just about anywhere in Slovakia, but I had it in Košice, a lovely town in the eastern part of the country. Bryndzove pirohy. Photo by Miriam Risager. If there’s an unofficial Slovak national dish, it’s deep-fried cheese. A thick slab of Edam or Ementhal cheese that’s breaded and deep fried, the dish is ubiquitous around the country. In restaurants, canteenas, and cafeterias around Slovakia, you’ll see it served with potatoes or, more often, French fries, a dab of tartar sauce for dipping, and sliced vegetables as a garnish. Generations of Slovak students survived college on deep-fried cheese. Slice the cheese into 1–1.5 cm slabs. Put flour, whisked eggs, and breadcrumbs in three separate bowls. Coat both sides of each cheese slab with flour, whisked eggs, and breadcrumbs, then again in egg and breadcrumbs to prevent the cheese from oozing through during frying. While the potatoes cook, fry the cheese in a pan filled with hot oil, 20–30 seconds per side, or deep fryer. Soak away excess fat with a paper towel. Serve with French fries or boiled potatoes, and with a tomato, cucumber, and pepper garnish. Traditional Slovak cuisine can be challenging for vegetarians. Few traditional dishes outside the potato dough-based ones described above appear on Slovak menus (and even some of those are often traditionally made with lard or sprinkled with bacon bits). Luckily, in recent decades the growing number of vegetarians have swayed the cuisine’s balance toward healthier fare. Quite common around Central Europe, grenadír probably originated in military kitchens of the Austro-Hungarian Empire as a cheap, efficient, and plentiful way to feed the troops. The dish is a mixture of boiled potatoes and flat, square pasta layered over sautéd onions and seasoned with paprika. Most Slovaks remember eating grenadír at school, where it remains a staple. This school cafeteria, dessert-as-main-course staple, valued and beloved for its quick prep and low cost, has become a true retro dish. Flour-based dishes that would be desserts anywhere else but in Slovakia are a main course. Beloved by children and nostalgic to hikers in the mountains, sweet dough dishes show the more tender, (grand)motherly side of Slovakia’s traditional cuisine. Ask a Slovak about buchty na pare and they’ll regal you with stories from their childhood, when their mother or grandmother (or both) made the dish a lot—but not often enough. Fluffy steamed buns filled with jam (homemade plum jam is the best), coated with sweetened butter and sprinkled with cocoa powder or finely diced walnuts or crushed poppy seed…need we go on? Slovaks place a lot of culinary stock in meat. Traditionally, meat was expensive and consumed on special occasions like pig stickings (the annual slaughter of the house pig), celebrations, or Sundays. The Slovak cuisine’s doughy focus originates in the high cost of meat. As the country developed, meat became a more integral part of the cuisine to the point where traditional meatless dishes feel like poor people’s food. On the flipside, Slovaks value rich red meat and smoked meat, with corresponding health outcomes. Schnitzel may have originated in Vienna, Austria (the Slovak version of it, anyway) but, like so many dishes inherited from the Empire period, it has become so entwined with the Slovak culinary culture it’s practically a Slovak dish. Served in restaurants as a standalone dish with potato salad, rezeň is a slice of lean, boneless pork (the word derives from the word for cut), tenderized into thin submission, breaded, and fried. Popular at fairs and markets, particularly around May Day and Christmas, Gypsy roast is a sandwich centered around a slice of lean pork, marinated in milk and garlic (some add mustard), and fried. Because it’s served in a bun or a roll, some Slovaks jokingly call it the Slovak burger. Pepper is another New Continent import that took hold across the Hungarian lands, making its way to Slovak cuisine. A popular dish, plnená paprika is peppers stuffed with a mixture of ground beef and rice and cooked in tomato sauce. Served with knedle (sliced steamed dumplings), potatoes, or rice. French potatoes is the Slovak version of the tartiflette, popularized, for unknown reasons, during socialism. The gratin-like dish is baked with cooked slices of the Slovak staple tuber, sausage, and hard-boiled eggs layered in a pan and smothered in a mixture of whisked eggs and sour or whipping cream, with cheese optionally sprinkled on top at the end. A favorite of campfire picnics, živánska adds a romantic element to Slovak cuisine. Pork chunks, potato slices, sausage, bacon, and onion chunks are rolled in aluminum foil, sometimes on a skewer, and grilled over open fire. Expert cooks make it in hot embers. The Slovak rendition of ham-and-eggs, the dish is quite self-explanatory. It’s a hearty go-to for every bachelor. My father used to make hemendex for himself when he came home late from work. Another Hungarian import, as the name reveals, this version of goulash revolves around pork shoulder chunks and sauerkraut heavily seasoned with ground paprika and thickened with sour cream. Served with knedle. When it comes to food in Slovakia, the locals sure do enjoy hearty entrées. Like most traditional Slovak dishes, even their meatballs cannot be made without potatoes. Mäsové guľky is a Slovak-style meatball dish made with minced meat enclosed in potato dough, served over steamed cabbage, and topped with roasted onion and spring onion. I first tried this scrumptious entrée at The Flagship Restaurant in Old Town Bratislava. Locals and tourists alike dine at this cozy establishment when seeking out traditional Slovak food and drink in a truly authentic atmosphere. This dish, among the many others that I tried throughout my time in Slovakia, was among my favorites. It definitely left me satisfied…and full! Slovak meatballs. Photo by Toccara & Sam. Salad in Slovakia is traditionally a small side, served to blunt the heaviness of the main course. Diced tomato or sliced cucumber salad are the most typical. Hearty salads, like potato or tuna, also feature prominently on the Christmas and students’ tables, respectively. More recently, Slovaks have grown to like salad as a standalone dish. Šopský šalát (Shopska AKA Bulgarian salad), a mixture of tomatoes, cucumbers, onions, peppers, and crumbled white cheese (sirene), is particularly popular in restaurants. In a nod to traditional Slovak cuisine, many salads nowadays feature eggs and meat like ham or chicken. Slice refrigerated cucumbers very thinly, for example with a mandoline slicer. Combine all ingredients in a bowl, and mix. The cucumbers will release a fair amount of water, thinning out the cream. What cuisine doesn’t have delicious snacks and sides? We’ve previously covered Malaysian snacks, and Slovak snacks aren’t that far behind. Similar to entrées, cheese and potatoes rule in this category of Slovak food as well. It’s quite amazing what Slovak cuisine can do with so few ingredients. 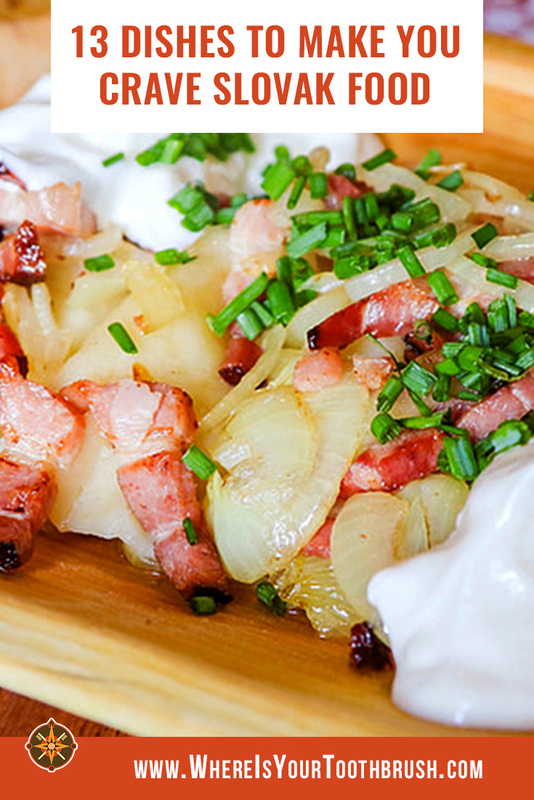 It goes without saying, that Slovak beer complements these typical Slovak dishes best. 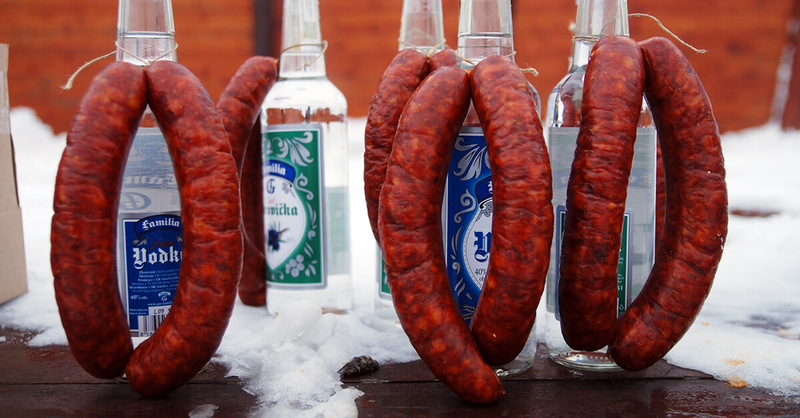 When Slovaks say “sausage,” they typically mean smoked pork sausage made at pig stickings. Served with bread, mustard, smoked pork sausage is a meat lover’s delight. Also common, in many regional variations, is jaternica (blood sausage), which, too, is best homemade. Sausages as prizes in a kapustnica cookoff. Image by Bratislavský kraj. Cheese tops the hierarchy of Slovak specialties, originating among the sheep and cow herders of old. The most traditional and typical are sheep cheeses. The reigning champion among Slovakian sheep cheeses: bryndza. Used in a variety of traditional dishes, bryndza is a natural, white, salty, spreadable cheese made from non-pasteurized, fermented sheep milk, sometimes with additions of cow milk. Liptovská bryndza is made fresh in the Liptov region when sheep are producing milk. Summer bryndza can contain cow milk and is leaner. Winter bryndza is fattier, combining stored sheep cheese with fresh cow cheese additions. Bryndza is so integral and original to the Slovak cuisine that Slovakia is the only country in the world that can make it (it is on European Union’s Protected Geographic Indication list). Aside from use in Slovak national dishes (see above), bryndza can also be consumed raw or in spreads, e.g. with paprika and onions. Bryndza contains a wealth of probiotic bacteria, proteins, minerals, and B-complex vitamins. The Slovak national cheese is both delicious and healthy (at least as far as cheeses go)! Oštiepok is a traditional dark-yellow shepherd cheese made in a decorated mold and marinated in salty water. Coming in smoked and non-smoked versions (I recommend the former), parenica is a flat strip of non-ripening cheese rolled into a tight coil. Parenica, too, has the EU’s Protected Geographic Indication. Literally “little whip,” korbáčik is a soft sheep cheese rolled into spaghetti-like noodles and woven into braids that resemble switches. Cheeses made from cow milk play a distant second-fiddle to sheep cheeses in Slovakia. But due to the lower price of cow milk and greater ease of production, cow cheeses have been gaining in prominence. I’ve known people who would cross the world for cheese. I’m sure you’re thinking of the pull of exquisite French and Italian cheeses, but would you believe I travelled for Slovakian cheese? Ok, I didn’t quite cross the world but I hopped in my car and drove 1,300 km from Como in Italy to the far eastern Slovakian town of Košice. I was there to sample food from some of Slovakia’s best chefs at the Košice Food Festival. I got to try modern takes on the traditional Slovakian food halušky, grilled local fish, and poppy seed ice cream. But where was the cheese? The cheese I discovered later at the Olive Tree restaurant. A delicious selection of Slovakian cheeses accompanied by a little fruit. Not all Slovakian cheeses are smoked but two of the most famous are. Both parenica and oštiepok are smoked. Both are so good they are protected by the European Union. Oštiepok originates in the Tatra Mountains and is a cheese often found at the Christmas markets in Central Europe. Parenica is quite different, being made of strips and rolled into a spiral shape. 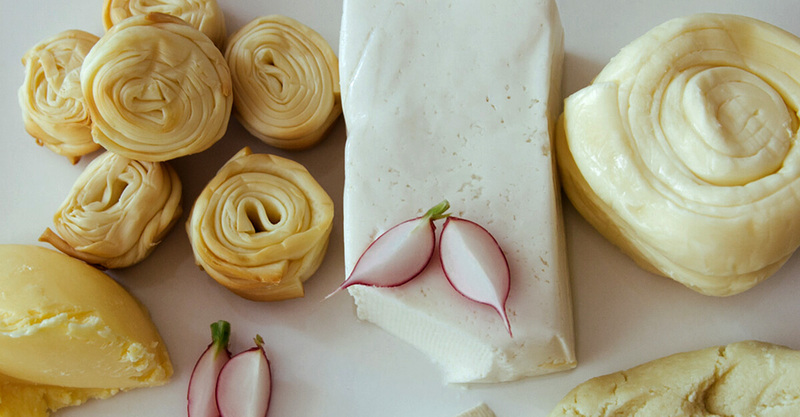 Slovakia has many great cheeses and intense, creamy butter, too—a surprisingly great destination for dairy products. From left: Oštiepok (bottom corner), smoked parenica, fresh sheep cheese, regular parenica. Photo by Andrea Anastakis. Often sold at markets and fairs as street food, lokše is a heavy, fatty flatbread made from potato dough, filled with savory fillings like liver pate, cracklings, lard, garlic, or sheep cheese, or with sweet fillings like ground poppy seeds or jam. In the fall, during hunting season, lokše accompany duck or goose dishes and are often made using the fat of those two birds. Boil potatoes whole with skins until soft. Let cool, peel, and grate finely. Mix in flour and salt, and knead on a flour-covered board into not-too-sticky dough. Roll the dough into a log about 60 cm / 2 feet long, cut it into 15 pieces, about 5 cm / 2 inches wide, and roll them with a pin into round pancake shapes. Warm a frying pan over medium heat with no oil, and transfer the flatbread pieces to it. When one side starts to bubble, flip it (you can pop large air pockets with a fork or knife). Each side should take about 2–2.5 minutes on each side. When finished, place the lokše on a plate and brush one or both sides with melted lard or duck fat or, if you want them served sweet, melted butter. Serve warm with fillings of choice. Pagáče are rich biscuits made from leavened dough with ground cracklings (oškvarky, hence the dish is often also called (o)škvarkové pagáče), i.e. rendered lard or pork rinds. Not to be confused with pogača or pogácsa, a type of bread made across Central and Southeastern Europe, pagáče can also be made with potatoes, cheese, or cabbage. Pagáče goes well with sour milk and Sunday afternoon old movies. Central Europe’s answer to pizza, langoš is originally a Hungarian specialty. But it is also popular in Slovakia, Austria, Czech Republic, Serbia, Croatia, and Romania. In Slovakia, langoš is street food that can be found where people want an easy and delicious snack—train stations, festivals, even bus-stop kiosks. 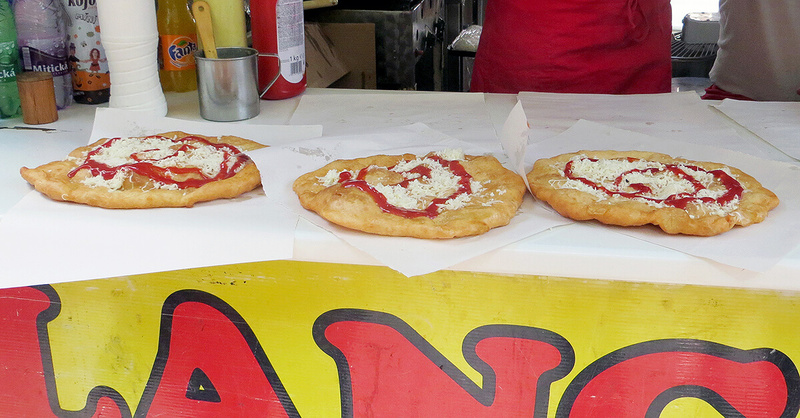 The flat bread—very similar to Native American fry bread—is really the highlight of langoš. It’s lightly fried, crispy and chewy, and it can be pulled apart or folded and eaten like a taco. Garlic, ketchup, cheese, and tartar sauce are the typical choices of condiments in Slovakia, and some places also offer sour cream and chocolate. The garlic tends to be strong but nicely offset by the sweetness of the ketchup and creamy tang of tartar sauce. Discovering a good sandwich is something that every traveller appreciates in any country. 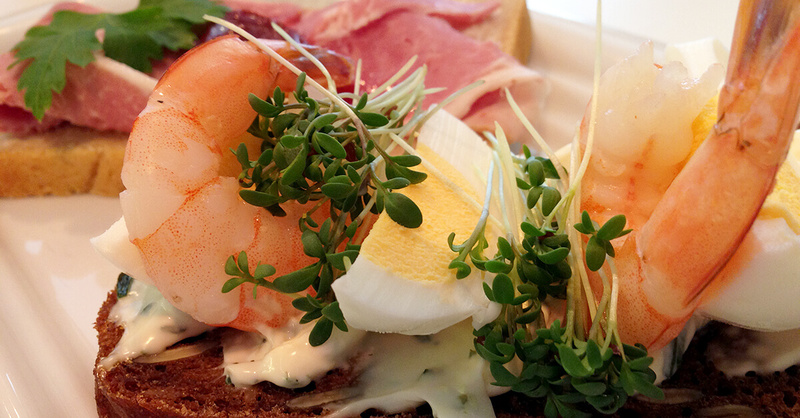 There’s something really comforting about a Slovakian open-faced sandwich, called chlebíčky. This roughly translates to small breads. It’s no secret that a Slovakian staple ingredient is delicious rye bread, which is served with every meal, freshly baked from small bakeries and almost every supermarket. They’ve taken the humble slice of freshly baked rye bread and, on special occasions, the fancy white bread, and they dress them with some simple but moorish ingredients. A standard chlebíčky is served at home for birthdays and family gatherings, but it can also be found in lahôdky (deli). The bread is traditionally spread with butter and thin layer of mustard. Sometimes an egg mayonnaise or red pepper spread is used. It’s then topped with either fresh ham or salami, slices of fresh tomato and red capsicum, some pickles, a slice of boiled egg, and finished off with finely grated soft cheese. Finished with some salt and pepper, this blend of ingredients just works! Nowadays, the chlebíčky served in small eateries and cafes are getting pimped out with some really interesting combinations. If you’re happy to pay a bit more, you can indulge in tasty smoked salmon, potato salad, and prawns combos or imported hams and cold-cut meats from neighbouring countries. I love eating these tasty Slovakian snacks all around this pretty little country. I always look forward to my next visit to see what I can eat next. Chlebíčky. Photo by Rachel Davey. As a potato lover from the American state of Idaho (home of the potatoes), I’m a pretty big potato critic. So, when I traveled to Bratislava I decided I had to try zemiakové placky to see what all of the fuss was about. I headed to Slovak Pub in Bratislava to try them along with a bunch of other traditional Slovak dishes. Zemiakové placky happened to be one of the best things I tried. They are potato pancakes fried in garlic and oil and made with flour, grated potato, and egg. Similar to the Jewish latke, zemiakové placky have different spices and are usually eaten as a snack or a side dish to your main meal. Let’s just say they are some of the most delicious types of potatoes I’ve ever had, and if I could get them as a side for every one of my Slovakian meals, I probably would! Zemiakové placky served with sauerkraut. Image by Alpha. One of the few things Slovakia is known for is the mountains, particularly the High Tatra range. There, alpine chalets serve hikers and mountaineers as places to rest, eat, and sleep. The chalets offer a very similar variety of snacks, dishes, and beverages, providing sustenance and energy for strenuous exercise. My favorite way to cap a strenuous hike is a combination of items introduced to me as a trio by Peter’s father: beer, Horalky, and borovička. Beer may not be the best way to hydrate. But at the end of a hike, a cold beer is the most refreshing reward you can have. 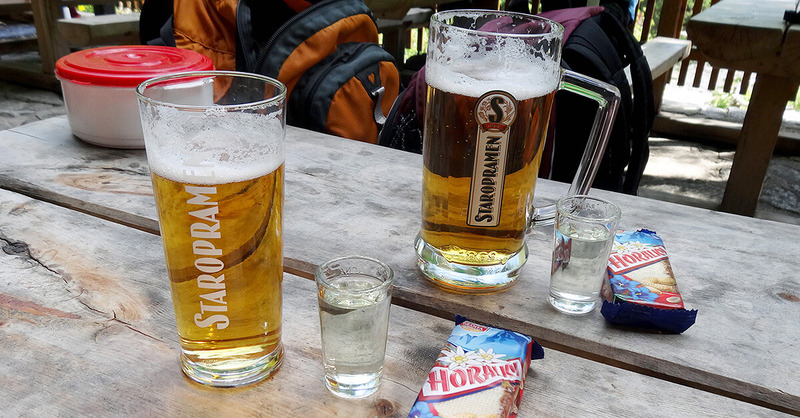 Chalets serve Slovak beer, like Šariš, from a region near the Tatras, or the country’s most popular beer, Zlatý Bažant (Golden Pheasant), or Czech beers, like the famous Pilsner Urquell or Staropramen from Prague. Horalky is a chocolate-glazed wafer with peanut filling. It’s popular with hikers who eat it as a break snack; the quick calories compacted into a neat little bar replenish your energy to keep you going. I love to eat one with a beer, sitting outside a chalet, decompressing after a hike. Finally, a shot of borovička livens the spirit tired from overexertion. Similar to gin but with a more complex herbal flavor, borovička is a traditional Slovak spirit made from juniper berries. Similar to potatoes, bread is a staple of Slovak cuisine. Typically consumed for breakfast, with various spreads, or to accompany sausage or soup, Slovak bread is dense, typically made from whole wheat or rye. “Potato bread” is also widespread, and the grain-growing regions of southwestern Slovakia are also known for baking white, wheat bread. Ask a Slovak freshly arrived to the U.S. for any complaints, and the first thing they’ll say is bread. In a large bowl mix well the whole wheat flour and warm water. Let sit for 30 minutes. Mix in a teaspoon of yeast, cover, and let sit for about 2 hours. Stir the well-risen dough until it collapses, cover, and let rise for second time, for about 90 minutes. Add another teaspoon of yeast, salt, and optionally other herbs, such as caraway. Knead the dough on a floured surface, repeatedly stretching and folding it over with your hands. Alternatively, you can knead the dough in the bowl using a wooden spatula. Dust a baking pan or Dutch oven with flour and transfer the dough. Let rise once again, this time for about 30 minutes. Preheat the oven to 390° F. Bake for around 80 minutes with a separate pan containing several ice cubes. Slovak food is not all meat and potatoes. The Slovaks’ sweet tooth leaves many a foreigner a few pounds heavier when they leave the country. 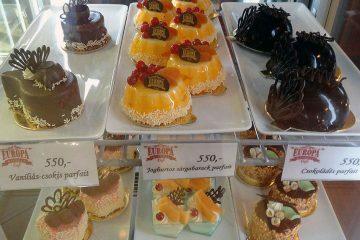 In fact, it seems Slovak cuisine is richer in the variety of desserts than other dishes. koláč is most often, but not exclusively, made with leavened dough. It’s hearty and doughy. Not to be confused with the Czech koláč, which is a specific type of dessert. zákusok is fancier and more festive, usually containing lighter dough, creamy filling, and glaze or icing. Served at weddings, with coffee, or at confectioner’s shops. With how much food you eat at a Slovak meal, you may not always feel like you have room left for dessert. But you do, trust us. How can you refuse a homemade strudel? You can also eat Slovak dessert as standalone snacks, like trdelník or Bratislavské rožky. Originally a Turkish dessert, reinvented by the Austrians, and imported to the Slovak lands in the 18th century, strudel is a classic Slovak dessert. Every Slovak has their favorite strudel filling, and each variation is named after it. Yours truly goes for poppy seed (makovník) or walnut (orechovník), my sister is a cocoa girl (kakaovník); fruity strudels are more common in central and western Slovakia. Increasingly, Slovaks buy strudel dough in stores and, worse, ready-made strudel as well. Make the dough from flour, butter, three egg yolks, baking powder, and salt. Flatten the dought with a pin on a dough-rolling board sprinkled with flour. Mix the filling ingredients together and cook the mixture in a bit of water so it becomes spreadable. Spread the filling on the flattened dough and roll it into shape, like a yoga mat. Smother the outside with a whisked egg yolk and place on a baking sheet lined with paper. Bake at 180–200° C until golden brown. Out of the oven, sprinkle or spray the strudel with water and cover with a teatowel. Slovakian sour cherry strudel combines three items quite common in Central European cuisine: sour cherries, poppy seeds, and strudel pastry. The filling mixes sour cherry compote (not terribly different from American cherry pie) with brown sugar, butter, and poppy seeds. This goodness is combined and spread out on super-thin pastry before being rolled up in the traditional strudel fashion. It’s often served warm with a topping of whipped cream. 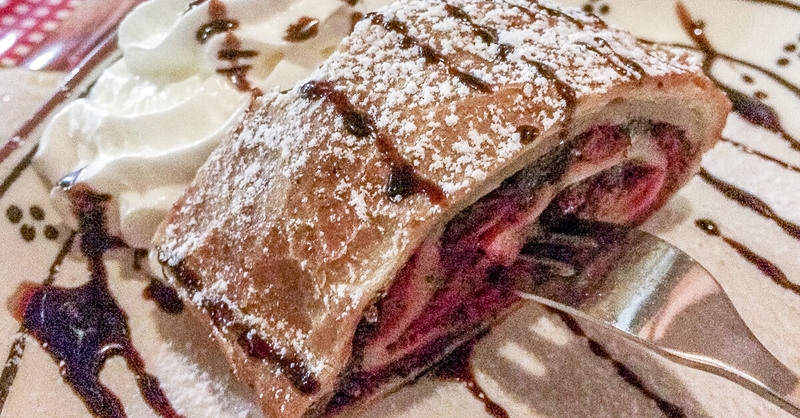 One of the best ways to try sour cherry strudel is in a traditional restaurant. Near the town of Ružomberok, we stopped at one that was built like a log cabin and had a giant wood-burning grill inside. With goats roaming the grounds and a view of the Tatras in the distance, it felt like the ideal place to try sour cherry strudel for the first time. Sour cherry strudel. Photo by Travel Addicts. by Hannah Lahodny, Where’s Hannah? It’s hard to say and hard to forget, trdelník is hands down my favorite Slovakian treat. 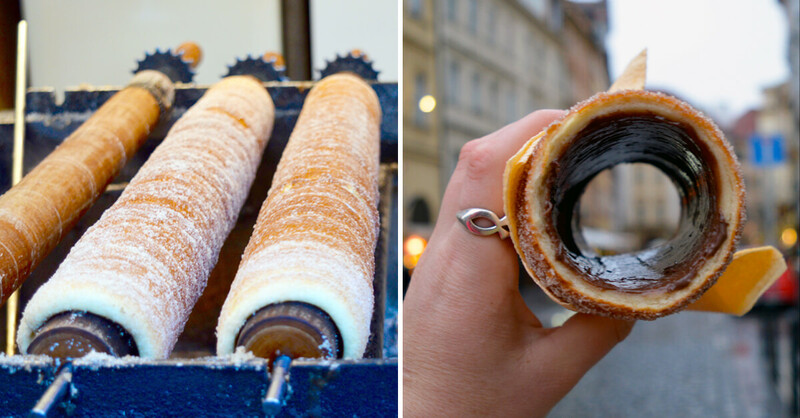 Although you’ll find it all over Eastern Europe, especially in Prague, trdelník‘s roots are truly Slovakian, with earliest recipes dating back to 1783. Its name is indicative of its cooking process: a trdlo is a wooden tool for imprinting and a stoupa is a hollowed out log. Add those together and you get trdelník—an irresistible, hollow pastry. You will smell trdelník before you see it; just follow the enticing aroma of cinnamon, sugar, and chocolate around the corner to the nearest food stall. It’s not hard to track down a hot roll of this doughy goodness, especially in the touristy areas of Bratislava, as food stalls are ubiquitous. The trdelník itself is made by wrapping dough around a stick and roasting it over a fire. The outside is then coated with cinnamon and sugar while its inside is coated in melted chocolate. What’s not to like? There is a plethora of other toppings you can add to your trdelník, from nuts to ice cream filling, but I found the traditional way the best. If you ever find yourself in Slovakia, do not miss the trdelník! Trdelník. Photos by Hannah Lahodny. 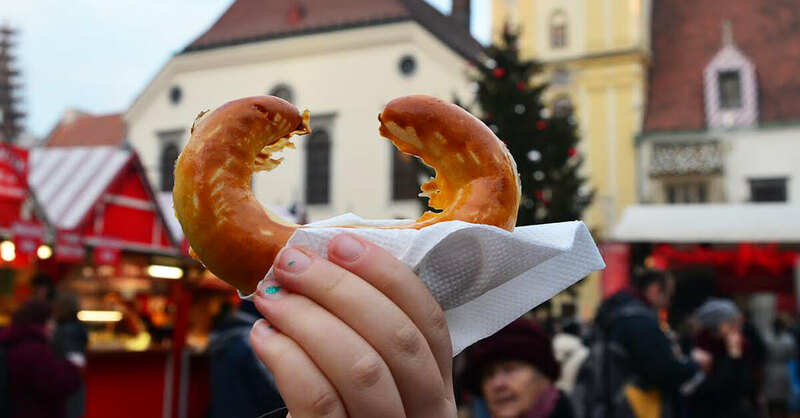 The Christmas Market in Bratislava teased our senses with the scents of sizzling meats, spicy mulled wine and freshly baked Slovak pastries. Of the many foods to try in Slovakia, one of my kids’ favorites was the traditional Bratislavské rožky, a crescent shaped pastry. Although poppy seed is wildly popular in Slovakia, we chose the walnut filling. The delicate flaky pastry was the perfect envelope for the sweet filling. If you are traveling to Slovakia, Bratislavské rožky should be high on your list of Slovak foods to try. No cuisine would be complete without beverages with which to wash down the food. Tap water in Slovakia is safe to drink and mostly tastes okay. It’s in mineral waters that the country shines. 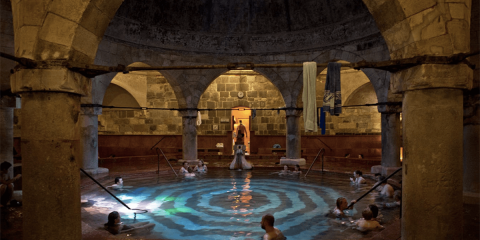 Slovakia abounds in mineral springs which produce waters with health benefits. Many liquid gems the Earth produces are bottled into commercial products, with varying degrees of carbonation (still – green PET bottles, gently bubbly – pink/purple bottles, bubbly – blue bottles). More concentrated springs, like those found in Bardejovské Kúpele spa, produce water consumed on the spot for healing purposes. Žinčica is a traditional Slovak beverage originating in the mountainous sheepherding communities. Fermented from sheep milk whey in the production of cheese and similar to kefir, it is traditionally served with dishes containing bryndza, like halušky. Due to its microbacterial content, žinčica is good for you. In cafes and restaurants, espresso is the most common drink, served on a platter with a side of soda water and a cookie, competing in popularity with capuccino. “Going out for coffee” is a common social event in Slovakia. Turkish coffee remains a popular way to prepare coffee at home, with hot water poured over finely ground coffee powder. Instant coffee like Nescafe is a staple of office workers and campers. The socialist enterprise’s answer to Coke and Pepsi, Kofola is a popular carbonated soft drink. More herbal and lemony than the American sodas, Kofola widely available on draft, and both Czech and Slovak companies compete with bottled versions. Vinea is a brand of carbonated soft drink made from grape juice, developed in the 1970s by vintners in Western Slovakia. Slovaks drink a lot. In 2010, Slovakia was the 10th country in the world in alcohol consumption per capita. 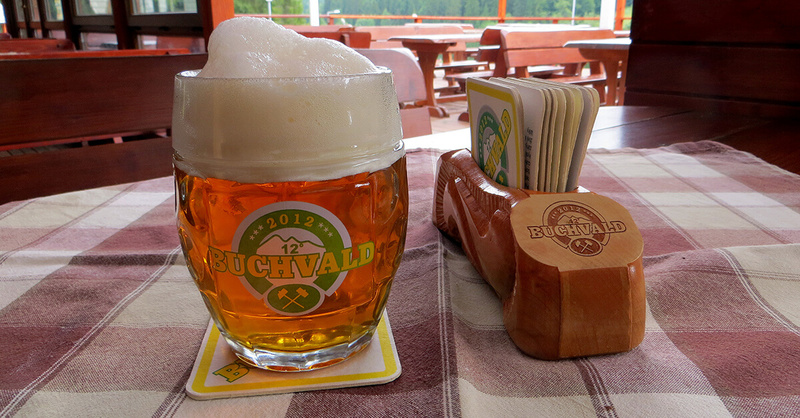 Slovaks drink more than 70 liters of beer per capita every year. 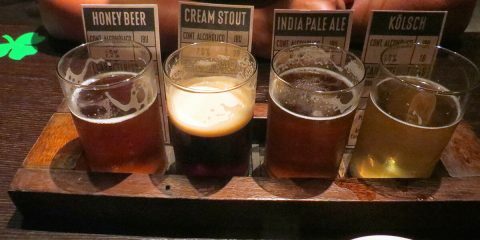 In line with global trends, a number of microbreweries sprung up in recent years (there were 56 in 2015), adding variety to the mass-produced beer from the four major breweries, Heineken/Zlatý Bažant, Topvar, Steiger, and Banskobystrický pivovar/Urpiner. The best lager in Slovakia. Wine has been produced in the Slovak lands since before the Roman times. Today there are six major wine-making regions in the country, located along the southern border, each producing its own characteristic varieties. The most “different” and famous one is Tokaj, in Eastern Slovakia, extension of the larger Tokaj wine-making region of Hungary. The ubiquitous Karpatské brandy (Carpathian brandy) is a liqueur distilled from the Veltlínske zelené wine. Nearly half of all alcohol consumed in Slovakia is in the form of spirits. Despite appearances, created with brilliant branding, Tatra Tea, a line of herbal, tea-based liqueurs, is a modern (est. 2008) invention building on the tradition of drinking liquor-spiked tea in the mountains. Finally, Demänovka is a bitter herbal liqueur, excellent as a digestif (there is also a sweet version). Traditional food in Slovakia can tax your body, what with its doughy, meaty, cheesy, cabbage-y focus, but as the travel bloggers who contributed their Slovak culinary experiences to this guide can attest, it’s delicious. To see your own “pretty little country’s” cooking through the eyes of this many foreigners (contributors hail from the United States, Canada, Puerto Rico, Australia, and Denmark) is, for a Slovak, a unique experience. And to learn something new as well is even better. Whether they ate traditional Slovakian food at a Slovak family’s home or, more often, at a restaurant, the dishes and stories the travelers shared reminded us how tasty Slovak cuisine can be. Alternatively, you can also place your hand, palm down, over your plate, shake your head vigorously, and slap your full stomach. Either way, Slovaks put their best foot (or is it plate?) forward when hosting visitors from abroad. Slovak hospitality is truly something to behold. Many restaurants serve traditional Slovak food. With the proliferation and popularity of world cuisines, it may be harder and harder to find Slovak national dishes. Koliba (literally, shepherd’s hut) or slovenská reštaurácia (any place with “Slovak restaurant” in its name) are a good bet. You can find restaurants serving Slovakian dishes in busy downtown areas, on roadsides, or in/near popular natural areas like national parks. A good way to recognize a restaurant offering traditional Slovak cuisine is log cabin-like exterior and interior and folk decorations or even agricultural tools on display. Make Slovak food at home! Though the site isn’t updated often anymore, the archive is chock full of best Slovak recipes written by Ľuboš Brieda, a Slovak from the central part of the country who moved to the U.S. with his parents as a kid (read my extensive 2011 interview with him). Otília Golis hails from my hometown Košice, in eastern Slovakia. On her Facebook page Slovak Homemade Cakes she features more than just Slovak pastries and other desserts, sharing easy recipes for a variety of Slovak dishes, of the traditional variety. She has also written the cookbook Otília’s Slovak Kitchen , available as both an ebook and in paperback. “Home-made with love in Slovakia,” Cook Slovak features recipes for typical Slovak dishes. The author, Jarmila Hlávková, also wrote the popular cook book, A Taste of Slovakia. In Slovakia food and drink are so good you’ll be inspired to write a cookbook about it. Almost Bananas stands out because it’s a cooking and lifestyle website written by a Canadian expat living in western Slovakia. Aside from recommending off-the-beaten path spots around the country, Naomi Hužovičová (her married name) writes about Slovak food and presents Slovak food recipes with the love and kindness of a foreigner who married into the culture. Well, we’re working on it! Such an amazing list of Slovak foods. I need to make another trip to try more of these. Yes, and when you get there—eat, eat! Yep, we didn’t have bryndzové halušky in Zdair. I would have remembered that! We did have some amazing soup at the Chata pri Zelenom plese during our High Tatras hike… it wasn’t the bean soup noted above but there were definitely beans involved and it was delicious. Is there a good Slovak restaurant in PDX? Inquiring minds want to know. Showing my age here, but I have not visited Slovakia since it was part of Czechoslovakia, which I visited in the late 1980s. I would very much like to go back to both independent nations today. We have a couple of local friends, each was born in one of the two nations, and they met working in a restaurant here in London and got together. She has shared a little knowledge with me about some of the food traditions of Slovakia but I haven’t come across most of your list, and now I want to try it all. Especially the bryndzové halušky – anything with potatoes, cheese and bacon is a winner for me. The vyprážaný syr also appeals, who can resist deep fried cheese? And yes to meatballs, always! Pierogi I already love, we have a few Polish restaurants in London where their national version of this classic are available. Oh and how can one not love a type of pizza where the base is fried rather than baked? When it comes to sweets, I’ve seen trdelník on TV and online, but never tried, so that would be top of my sweets list. No worries, Kavita. I was born in Czechoslovakia, though at the end of the 80s I was still in elementary school. As a Slovak, I highly recommend visiting Slovakia, of course. 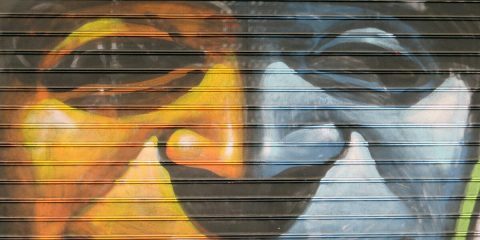 Check out our other posts about Slovakia around this website, and if you do go, let me know, I’d be happy to answer any questions. I am embarrassed to say but I had no idea what Slovak cuisine is. I have heard of some of these dishes but didn’t know they’re Slovakian. I love everything that is listed here, from the from the bean soup to the meat balls, the open sandwiches, potato pancakes and sour cherry strudel! If I ever land up in Slovakia, I’m going to hog! Don’t be embarrassed, Medha, Slovakia is a small and little-known country. We love spreading the word about it. I really love trying the local cuisine whenever I travel. I’m particularly interested in the Slovak dessert and treats since I have a sweet tooth. I’ll definitely try cooking Slovak food if I can find the needed ingredients here in my country. Just be careful, you might end up eating nothing but desserts! If you are interested in cooking Slovak food, check out SlovakCooking.com. Of these I have had only trdelník and that too in Budapest not in Slovakia. You can only eat so much in a day. Hope you visit Slovakia again and eat some more! I used to live in an area that had a whole bunch of great slovak eateries and I miss it so much! Especially after reading this! SO HUNGRY! Was this in the US, Kevin? I’d love to visit some day. I am especially interested in the pierogi! <3 I love soups in bread bowls. They should make it that way everywhere. Oh my goodness… my mouth is literally watering reading this post..! I WANT those cheese dumplings and a cold glass of pilsner right NOW! If there is one thing that will make me travel to a country it is the food and I must admit I knew nothing about the food in Slovakia but it will be now be on my list of places to visit! Glad we could make the introduction to Slovakia for you. Now go eat! 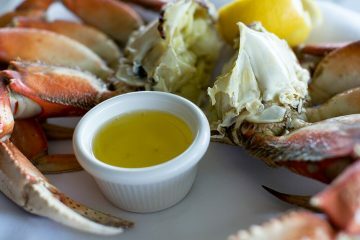 Oh no, sorry to make you hungry. Tough to eat off of a screen. I needed a nap after the Bryndzové pirohy but can never pass up pastries. 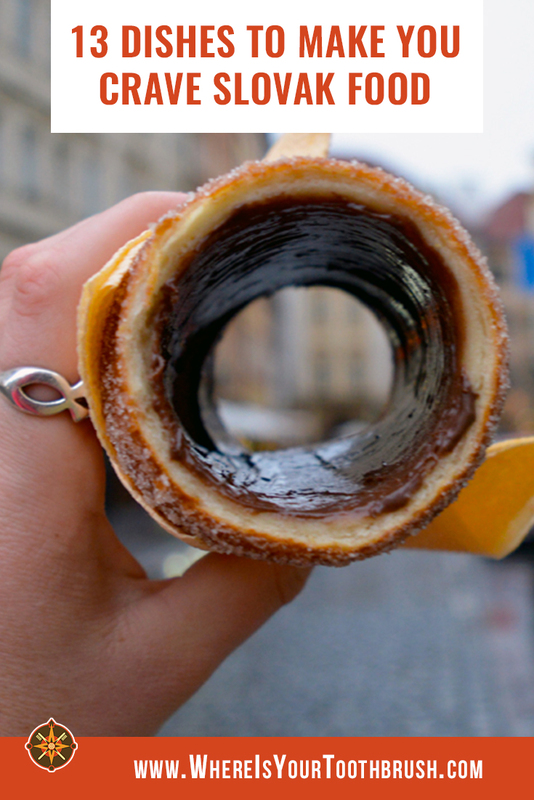 Trdelník sounds just perfect, cinnamon and chocolate together, oh boy. Everything sounds wonderful. Yes I fell in love with the food and would love to try it for myself especially the Bryndzové pirohy! Think the Višňová štrúdľa (sour cherry strudel) would be top of my list though… delicious! Honestly, I have never even had sour cherry strudel, it isn’t that much of a thing in Eastern Slovakia. So I can’t wait to try it, too! I don’t care of it’s ‘hearty’ to use a euphemism – I love this kind of food. I could definitely go for the deep fried cheese balls! And since I would cross the world for cheese, I’d love to try some of the smoked ones too. Cross the world for cheese, huh? 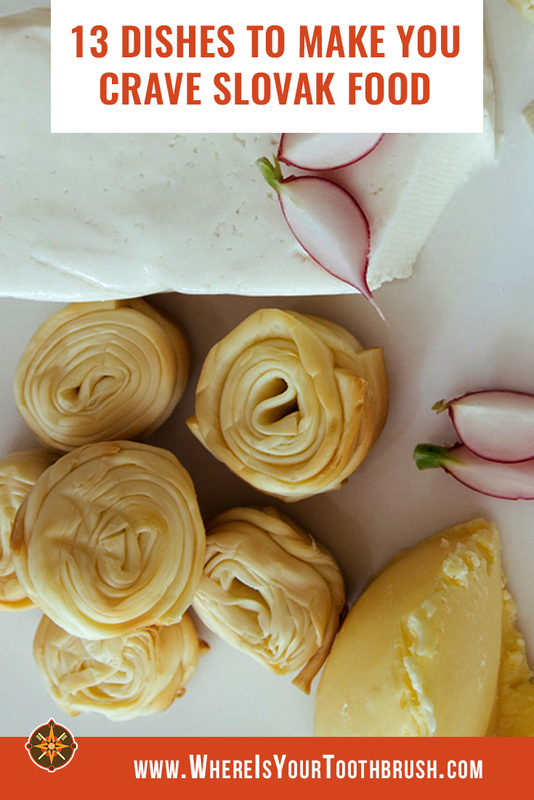 You’ll love the smoked and sheep cheeses of Slovakia. At first I thought I was going to die in Slovakia with all of these Sheep Cheese meals ( I am deathly allergic to a protein in Sheep & Goat Cheese) or Darcee was going to die from me polluting the air with all the yummy saurkraut soups and bean dishes! But it all looks so yummy! I love the desserts section. The Mäsové guľky and the Potato Pancakes look right up my alley! Sorry to hear you’re allergic to sheep/goat cheese. There are other yummy dishes to eat in Slovakia, so you’d definitely not go hungry. I must admit I don’t know that much about food, but I do love to eat it 🙂 Thanx a lot for some great tips about Slovak food! It’s already making me hungry! That’s just it, even if you don’t know much about food, you do eat it. Enjoy! Mmm these all sound so good! I used to live in the Czech Republic and loved the food there – it seems to be similar, though still a bit different, to Slovak food! Hopefully I’ll be visiting Slovakia next year and can try it for myself. your photos were all too tempting!!! nice that you were able to capture what would be the best to try out as well. We’ll look into it. Thanks! You need to try also bean soup, but without cream, its also excellent (also can be called as HRSTKOVA POLIEVKA). 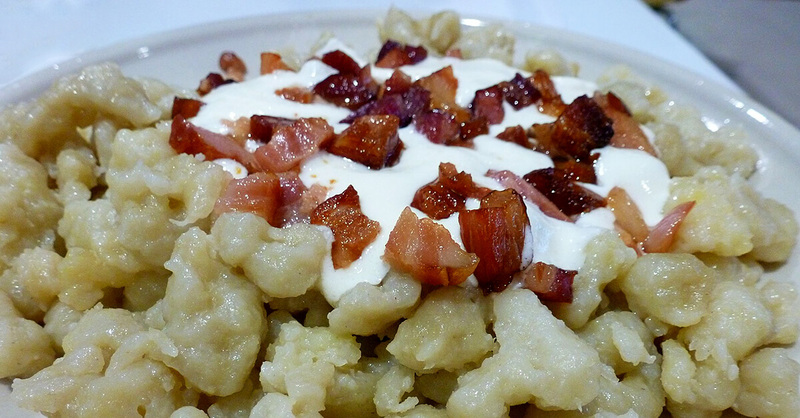 Also “TVAROHOVE HALUSKY”, same potato dumplings, crispy bacon but with cottage cheese. We “slovakians” eating “halusky” also with cabbage (same cabbage wich you can find in “kapustnica”). Its too many foods wich you will love it, but most of them are not any more in restaurants.